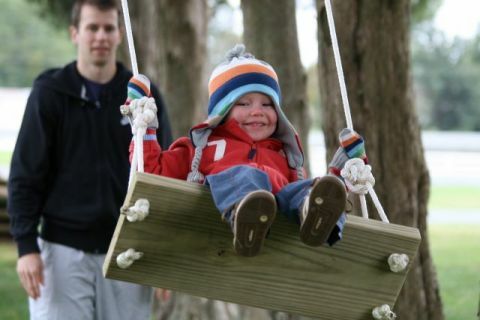 Friday, Campbell and Mara got to go on a little field trip that Lisa setup for Campbell. 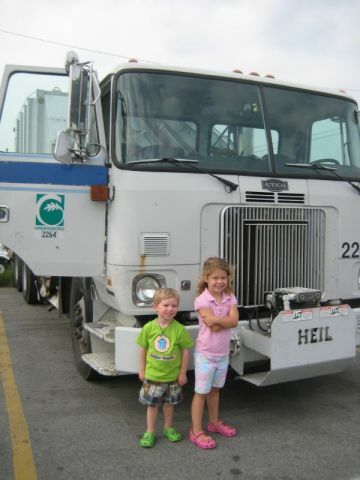 She did all the legwork to find out where they could go to visit the city garbage trucks. 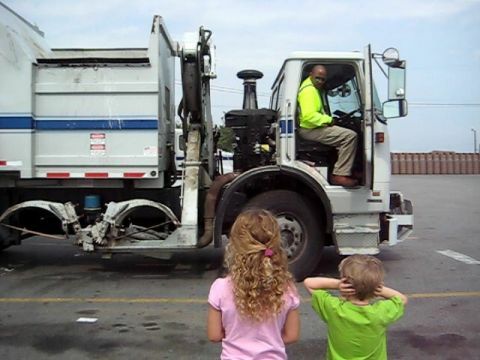 Don’t ask me how, but she got connected to Mister Henry in City of Greensboro Field Operations, specifically the Trash Collection Department and he allowed them to come visit for a little tour. I have no idea if they do this normally or not, for school classes or what, but they did it yesterday for Campbell! 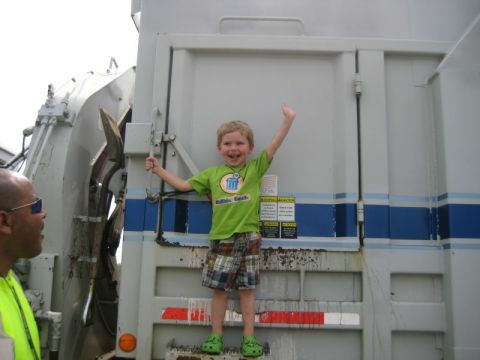 They got a tour of their garbage truck parking area and got to see all different types of trucks. 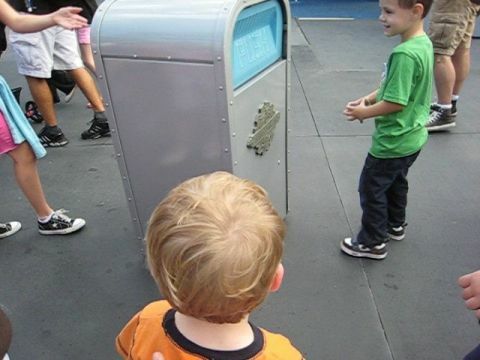 Then they took a look at the garbage truck in detail. 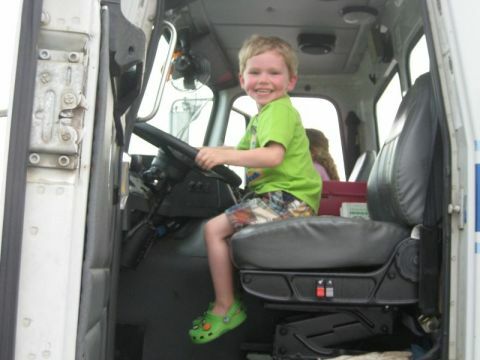 Mister Henry showed them the ins and outs of a real garbage truck. Campbell got to see some of what he usually plays with as toys, in real life action. Here are two other videos of their tour if you are interested. This has to be one of those times that you are just amazed at how nice some people can be to take time out of their jobs to make a special day for a little kid. Government connection or not, this was just superb service for any business to do. 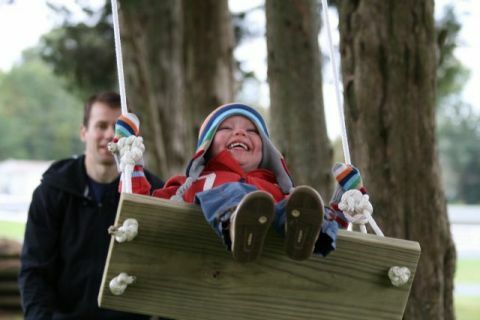 And many, many thanks to Lisa for the thought and creativity to create this experience for him. We are very lucky. Click through any of the pictures to see the whole set. No, this isn’t School House Rock or an ESPN commercial. Campbell is turning three years old! We just had his birthday on Saturday and had a great time. 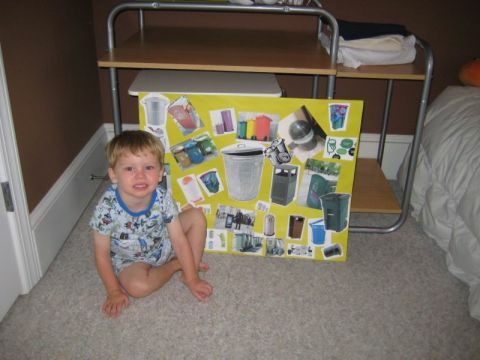 We were set on having a trash themed party for the little man and he was super-excited. When we went out searching for things to make the party theme at the typical supply websites, there was not a lot to see. Through some searching though there were a couple of websites that we found. Most actually read the same way as this post, saying that there isn’t much out there to guide you. We found this post at pinkpeppermintpaper.com especially helpful, and we stole some ideas. Some other ideas we borrowed and built upon. And some didn’t get used at all since she is too ambitious for us. The day started out with Campbell discovering one of his surprises early in the day. Mom and Lisa made a shirt for him to wear with a big garbage can on the front. 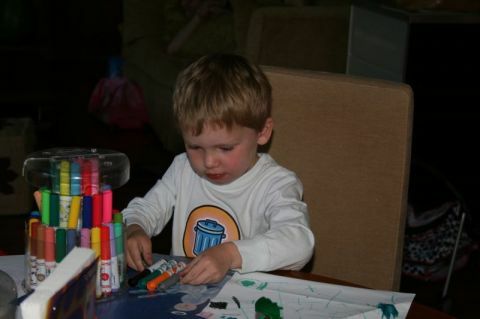 Luckily he found the 2nd shirt that was made, and his shirt for the actual party remained hidden. You will see that later. Already getting busy in the morning. The linchpin of the party was the blow up bouncer truck that we rented from a local rental shop (looked for a link, and can’t find a website). It was super cheap and super easy. They came and set it up and left it for hours and the kids loved jumping in it. We were fortunate to have wonderful weather so it wasn’t too hot for it either. It was a monster truck shape, so not exactly the right theme, but very boyish. I Stink and had them thrown all over the yard. 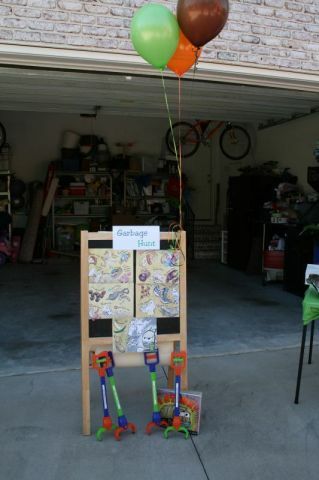 We took the kids easel and posted copies of the book pages on it so the kids could pick out what they were going to go hunt for. This one’s success was a little bit of a surprise since the kids not only did it one time, but went and did it repeatedly over and over. Ready to find some garbage with the pickers. Next came the birthday cake. Mom took a lot of time and a practice run to make this cake and it turned out fantastic. Campbell got free reign on this one to eat as he pleased. No, he didn’t eat the whole thing. One of the reasons he got it and we didn’t bother to plan to cut that up for everyone was the shear awkwardness of its shape, and the fact that we didn’t plan to make it big enough to have a piece for everyone. The intent was more to make the effect of it being a garbage truck. That was a success. 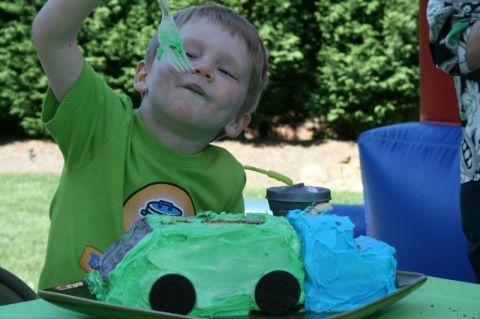 So, since Campbell alone got all of the cake, what was there for the rest of the kids (and adults too)? 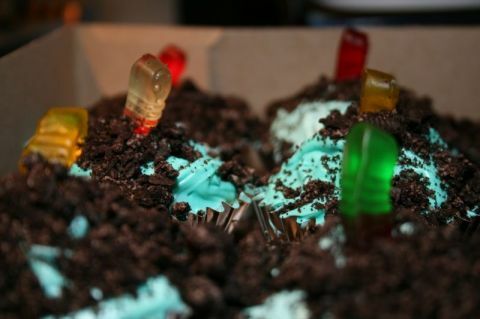 Dirt cupcakes. This idea was a little bit from the dirt cups that you can get at Mimi’s Cafe from the kids menu combined with a regular old cupcake. The cupcakes were frosted as normal, but then crushed Oreos were sprinkled on top and a gummy worm stuck into the middle, popping out like out of an apple. Ewwww. Lastly all the kids got to take home a little goodie. 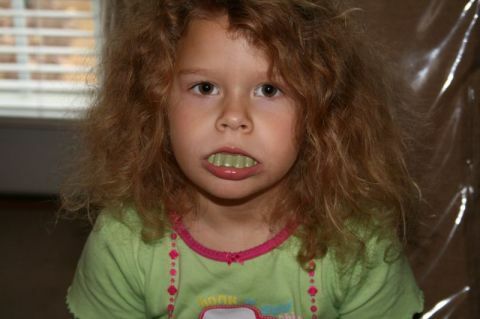 The hardest one was making bottlecap necklaces. Needless to say Dad made them about 3 times before the last trial of getting them about right. Still the process had something left to be desired and there has to be a better way. 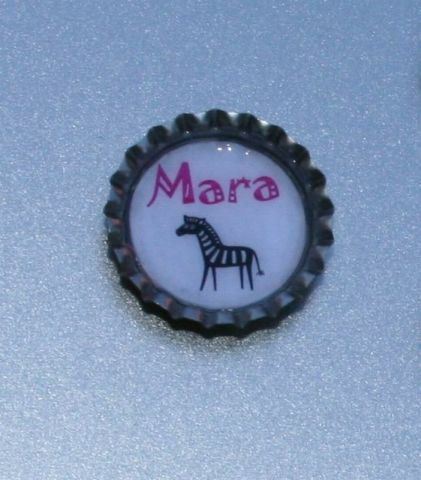 But, they ended up being a customized little trinket for each child and they seemed to like them. They also got to take a garbage can cup home with them which is the same cup that Campbell got to drink from at the party (not literally). There are many more pics of the party. Since I tried to make this post with the built in WordPress media uploader, I am completely lost in how to simply link to the album. So instead, you get to see all the pictures right here. Not ideal and I hope to fix it. Update: I went back to the old standby, Photopress, and reloaded the pictures and replaced them in this post. The built in WordPress Media Manager just wasn’t working well for me. I’m sure I’m doing something wrong. A little while ago we began taking some pictures of him next to his inanimate friends. I cannot remember if he was the first to ask for it, or we just started doing it. But, he rather enjoys it. Here are a few of the pictures we have shot. Taking a break from kicking the ball around at the school. On a hike at Pilot Mountain. Photo shoot in downtown Greensboro. If you want to look at all of them that are posted you can look in the album here. I expect that we will be shooting some more and adding them in over time (maybe). As another sign of growing up, Campbell has gradually been making a progression out of his crib to his more “permanent” of a resting place. And since I missed the in between post that I originally intended to make when he made the big step to a bed, this post will be all encompassing. A short time ago we decided that we would get Campbell’s bedroom upgraded and coordinated. It wasn’t that we didn’t like his original furniture, but soon it was time for him to move up in the world and get out of his crib. That set in motion a series of events. First he made the move from the crib to the bed we had in Mara’s room. Mara got moved into a bed we had in storage. I think we did this at about two and a half for Campbell, a few months ago. He was so excited to be in a bed. We were lucky as he took to it pretty well at first. It was nice for a time when he didn’t get out of bed, until that moment when he realizes, “hey, I can get out of my room and go talk to Mom and Dad.” He gets out of the bed a little more than Mara (unfortunately we are still dealing with that). That brings us to a couple of weeks ago when we made a trip to Ikea to purchase some new bedroom furniture for Campbell. Ikea is kind of ideal for kids furniture since it is inexpensive and you don’t really need much. Mom settled on a set of white furniture and it goes well with his brown walls. Campbell likes it enough. Let’s see if he can stay in it as it is a little farther to fall out of. I think he has done that once or twice so far, but luckily no serious injuries! Last week we made our first trip down to Walt Disney World. 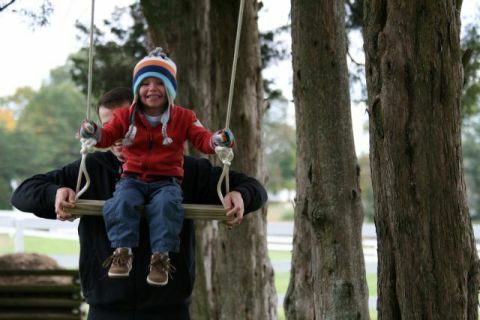 We had a wonderful time and the kids absolutely loved it. After telling you about Campbell’s infatuation with garbage cans and vacuum cleaners, our trip was met with some unexpected excitement. 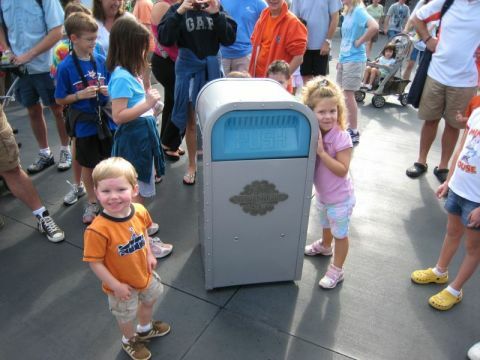 To our surprise they have a moving and talking garbage can in Tomorrowland. There is no schedule so there is no guarantee that it will be out and about at all, much less when you are in the area. On our first walk over to the area we had the chance to see it right away. This worked out really well since we had begun to hype it up to Campbell the day before. Campbell and Mara chased it around for a few minutes and as you can see got a chance to pose with it. We took some video too so that you can see what it in action. Enjoy! Warning! The file is large. On a recent trip for business Mom sent an email to Dad. The simple subject line read, “Something to brighten your day.” I thought I would share the content with all, since I think it could brighten your day as well. 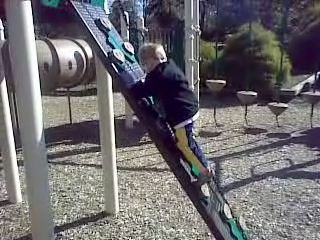 Just posted this entry to Mara’s website, but thought I would chronicle the video here as well. You might need to use Quicktime to view this. Watch out! 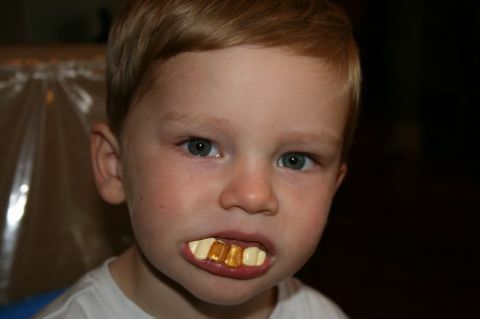 Halloween candy will rot your teeth out! We cannot say yet if the hair is also affected by candy or not. It’s another spooky night. 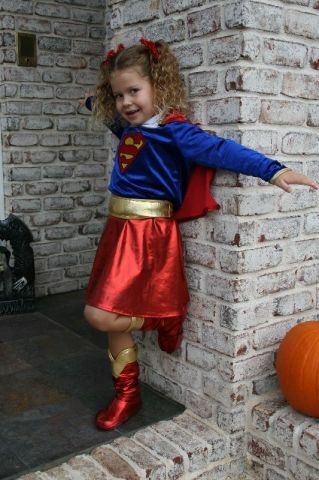 The more the world needs some super heroes to save the day! 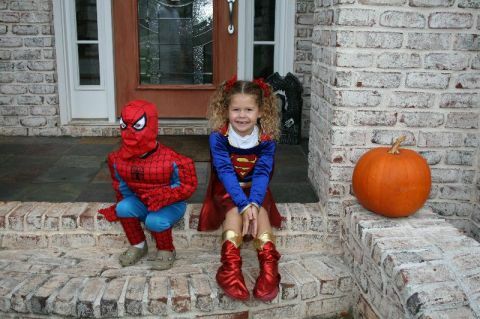 The kids are all ready to go out trick or treating. They have been excited all month for this day. 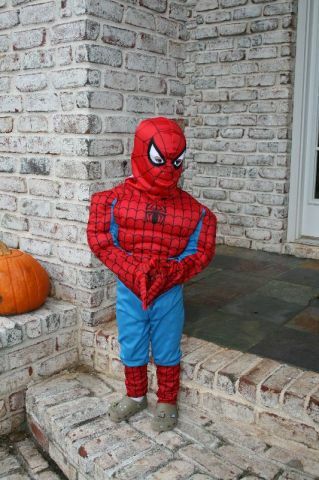 We really got good use out of the costumes this year. Campbell loves his so much that he has been going around wearing his almost every day this month since we bought it. He even went to a puppet show out at a local firehouse in it and all the other kids thought it was so cool! Click through to see some additional pictures that Steph took. For those of you who don’t know Campbell all that well because you don’t get to see him, you might not know what he likes and he doesn’t like. He likes the color green best. In fact, he has never wavered on that. He likes his best buddy Bubba that he sleeps with every night. But what he may be most infatuated with is trash cans. And running up a close second to that is vacuums. This has been the case since he was a little little boy. If we are out for a walk, he points out the trash cans in the neighbor’s drive way. Mondays are his favorite day because that is trash day around these here parts. Watch out, if there is a trash can tipped over on trash day, Campbell just might run outside to try and pick it up. This boy was born to clean. There is something about it, because he will help you out whenever you want. And his favorite tool for the job? A vacuum. He will bowl you over if you get in his way in Home Depot on the way to the vacuum section. Once, we were in Sears and we turned the corner to appliances and it was like the holy grail. “Vacuums!!! Red ones, and purple ones, and black ones, and…” We had to sedate him. Whoa! Vacuums on green? That’s like chocolate and peanut butter. 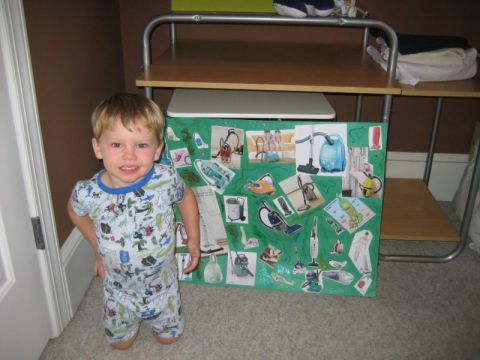 Mom was nice enough to help him make these collages one weekend. He loved it and was proud to pose with them.